The nuts are roasted over an open flame in its thick outer shell and cracked by hand. The outer shell contains the cashew nut oil. When cracking the nuts, it is best to use gloves because the oil can temporarily strip the thin top layer off the inside of your hands. The oil has many industrial uses in other countries; in India it is used for varnishes, paints and adhesives. In Brazil a tea is made from the cashew bark and is used to stop diarrhea, while the shell oil is used to treat skin infections, warts, intestinal worms and parasitic larvae beneath the skin. Within this outer shell is the soft white kernel, covered by a delicate layer called the testa membrane. The kernels are sun dried to reduce the moisture or to kill any possibility of insects. The next process is to roast the kernels in an oven to a golden and crispy hue, and then the testa membrane is removed, which gives the whole beautiful appearance that we are familiar with in the stores. Salt or sugar can be applied to this most delicious nut, but eat as you wish. Cashew nuts from Crooked Tree Village are 100% natural, no cholesterol, no chemicals or artificial flavors and are a good source of protein. The cashew apple is rich in Vitamin C and Vitamin B12. The Vitamin contents are higher than most major tropical fruits. It also includes fructose sugar, which is a diabetic tolerant sugar. 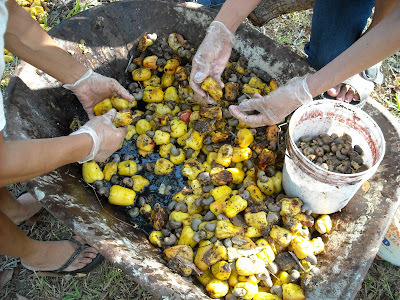 Wow..this brings back so many memories - of waking up early in the mornings before going to school to pick cashew seeds. I used to half fill a 1 gallon paint can with white sand, and the top half with cashew seeds - in that way, I could get to school on time. OK - I used to dislike picking cashew seeds - love eating the nuts though. Very good article Linda. You did it again. Thanks for the video. It is very educational. Hey Linda, So glad we are face book friends. I enjoy all your information and updates on the happenings in Crooked Tree Village. Thanks for making a difference for all!! !